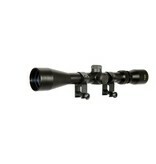 This Lancer Tactical 3-9x40mm Rifle Scope is a great, and inexpensive, way to add magnified optics to your airsoft gun. This model is capable of being mounted on multiple platforms via 2 included scope rings. The mil-dot cross hairs are adjustable for both windage and elevation. A knob on the scope will allow for variable zoom, and is capable of 3x to 9x zoom.